In much of Mythic Europe, magi build covenants in the remote wilderness to avoid contact with mundanes. In northern France - the Normandy Tribunal - this is all but impossible. The wildernesses have been tamed and plowed under, the Church plants monasteries in the wastes, noble lords build castles to enforce their rule, and great cities grow up where once was nothing but fen. The magi of the Order of Hermes have adapted to living closely with mundane society in Normandy, even distributing their limited magical resources by way of contests modelled on the chivalric tournaments of the nobility. But while magic is under pressure in Normandy, it is far from dead. Ancient megaliths stud the landscape, faeries control many forests, and caves and burial mounds hide relics of the past. Demons and monsters imprisoned in ages past by saints and sorcerers stir uneasily in their confinement, and magi wield potent and spectacular magic throughout the land. 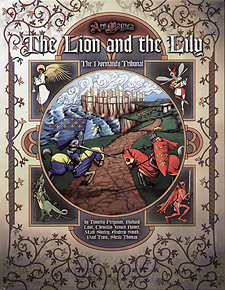 The Lion and the Lily provides full details for the Normandy Tribunal, where magi must balance the demands of the nobility, cities, Church, and Tribunal.